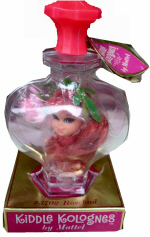 Kiddle Kolognes were scented dolls that came in clear plastic perfume bottles. The dolls are 2" tall, the bottles are 4 1/2" and open up to hold the Kiddle. They are marked either Mattel Inc. Hong Kong or Mattel Inc. Taiwan. They were made from 1968 to 1970. Apple Blossom has green or yellow hair. Her bottle has a clear front, a green back and an orange cap and base. Bluebell has blue hair. Her bottle has a clear front, a blue back and a hot pink cap and base. Gardenia has white hair. Her bottle has a clear front, a green back and an orange cap and base. In the 1990s, Tyco sold a similiar Kologne type doll.